Send us an email using the convenient form below. What is your #1 accounting concern? You love being in business! We understand this. 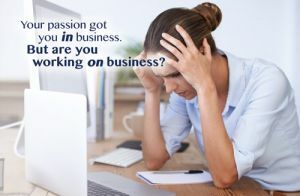 It's easy to forget to work ON your business when you are working IN your business. Many of our clients engage us to completely handle all of their accounting needs. In other cases, clients will do the basic accounting work in-house, then have us review and generate accurate financial statements. We provide flexibility in how we work and can accommodate most any situation. Managing the day-to-day accounting of your company can be a drain on you as a business owner. In our role as CFO/Controller for your company, we can assure you quality and continuity of services, without having to provide training and a "learning" period. This will allow you to work on the business, not on the books.